Go SaaS cost-effectively! Technousa's SaaS experts help businesses leverage SaaS/cloud computing for business growth fully and cost-effectively. Our SaaS experts have vast experience of delivering numerous SaaS applications successfully. Minimize IT cost. Reduce IT related Complexity and Work Load. SaaS (Software As a Service) is a cloud-based software licensing and delivery model that delivers software applications to clients over the Internet on-demand. This model helps you to cut software installation, up-gradation/management, maintenance and other related costs as applications are hosted and managed remotely by a third-party vendor. This model helps you to worry less about IT/Software management and enables you to focus on your core business. It results in significant cost-saving as you don't have to have dedicated resources/department to manage your software applications and related infrastructure. Moreover SaaS applications can be accessed from anywhere and on any device. Seamless upgrades, scalability and integration are some of the features that make SaaS model profitable and attractive to businesses. Other benefits that SaaS offers include great user experience and better collaboration, high security and compliancy and multi-tenant efficiency. 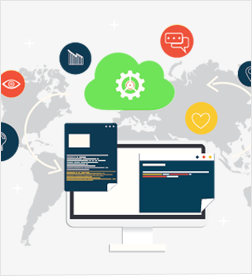 Technousa is one of the best offshore custom SaaS Product/Application Development Companies with offices in USA, India and UK. Our SaaS Application development team has several years of experience handling and delivering SaaS app development projects. Our SaaS experts have vast knowledge, experience and expertise to develop SaaS applications for various business process requirements including CRM, B2B, B2C, ERP, CMS, Supply Chain Management and more (see our SaaS offerings list below). We build high performance SaaS applications that are scalable, reliable and secure. Technousa also assures superior service guaranteed by service level agreements (SLAs). SaaS Product Conceptualization and Prototyping. SaaS Application Deployment, Testing and Maintenance. SaaS App Integration into an Existing Business Process. We offer custom SaaS solutions and services to both enterprises/businesses that want to move to SaaS/Cloud and also ISVs (Independent Software Vendors) who intend to migrate their licensing models to SaaS. SaaS for Messaging Solutions and more.